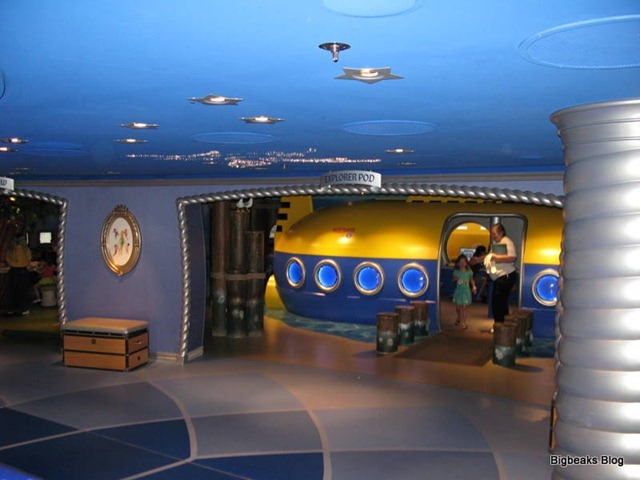 The Oceaneer’s Club features four primary areas that are themed to Toy Story (“Andy’s Room”), Tinkerbell and other fairies (“Pixie Hollow”), Finding Nemo (“Explorer Pod”), and Monsters, Inc. (“Monsters Academy” which, possibly not coincidentally, is also the title of the prequel film currently in production). 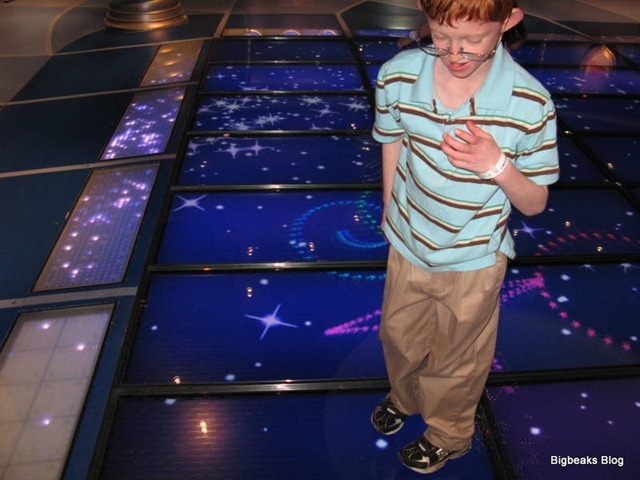 These rooms all branch off from a central area that is dominated by a large, interactive digital floor, essentially a large touchscreen used for a variety of games and activities. The central room also features a stage area used for storytelling and other presentations. 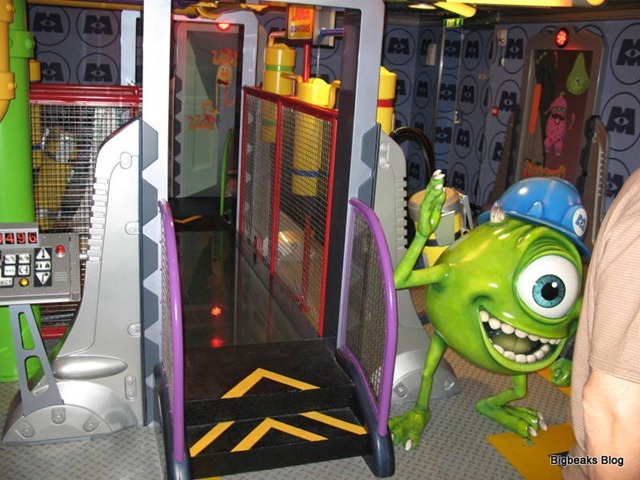 The Oceaneer’s Lab is more activity-driven than theme-driven, with areas for playing video games, watching movies on a big-screen TV, using computers and participating in various arts and crafts projects. 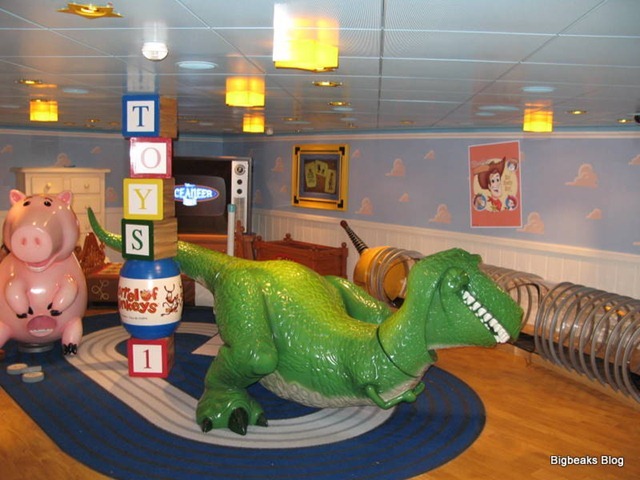 The main lobby area of the Lab includes another stage for storytelling as well as a big-screen monitor (103-inches, according to the Disney Cruise website) that can be used for showing movies or, periodically, for interactive sessions similar to the “Turtle Talk” attraction at the parks or the show in the Animator’s Palate restaurant. This first visit was pretty time limited due to our upcoming dinner, but we did get a good look at the area and it definitely whetted our son’s appetite for more extended time there. In fact, he was pretty much pushing us to promise that we would let him go back there for a little while later that evening. Traditionally, dinner on a cruise ship is a pretty big deal. Meals are typically multiple-course extravaganzas, presented with personalized service and a fair helping of panache. The evening meal also typically takes about 2 hours or so, meaning that a certain amount of patience is also needed. 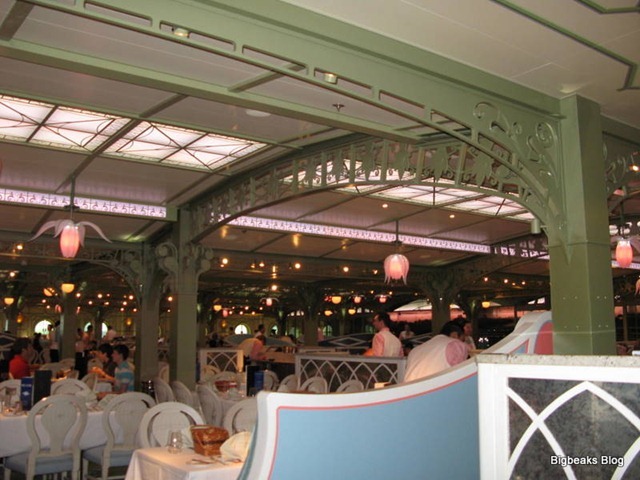 Disney added an additional element of variety by including three main dining rooms on each of their ships and having the guests rotate through them. 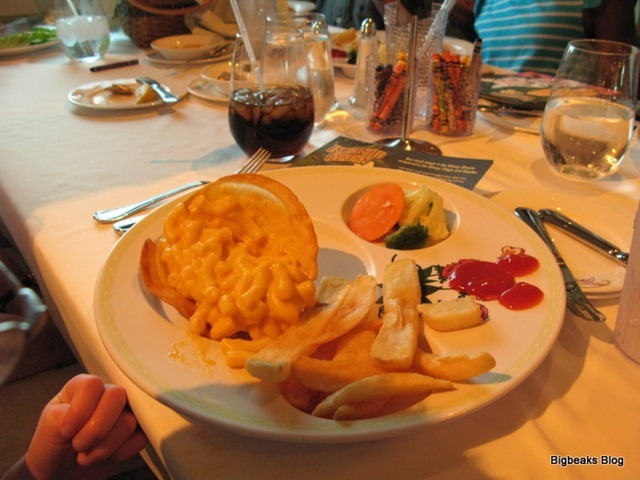 The first night’s dinner on a cruise ship has a bit of a getting-acquainted element to it. Every night, guests are seated with the same tablemates and served by the same primary and assistant servers. Most of the tables in the dining rooms seat six or more people, so smaller groups will typically be seated with other guests. On this trip, we were seated at a table for eight along with an extended family of five. The dinner menu is divided into four courses: starters, soups/saladx, entrees, and desserts. They are very flexible about what you can order. If you want to skip a course or have two starters instead of a soup or salad, it isn’t a problem. Typically, they will even accommodate if you want two entrees. One of the best parts of a cruise is that they really do try hard to meet individual tastes and preferences. My wife is not an overly adventurous eater (and doesn’t like any kind of seafood) and often asked for customizations or even choices not on the menu. This never really proved to be a major problem. I started with lobster ravioli, which was very tasty and contained a very generous amount of lobster meat. I didn’t get a soup or salad that evening, a smart choice as the ravioli was pretty substantial. My wife had a tossed salad and my son had soup. He is a big soup eater, something that had even become a bit of a running joke on our previous cruise. I can’t recall what the soup was that evening, but I remember that he did seem to enjoy it. For my entree, I selected a roasted pork tenderloin, which was very good. I really enjoy a good pork steak and it something that I don’t get very often, which made it a fairly easy choice. My wife selected the grilled NY strip steak while my son had macaroni and cheese. The kids’ meal macaroni and cheese had a particularly nice presentation, with the pasta served inside of a tortilla shell with a side-order of french fries. The assistant waiter added ketchup to the plate in the familiar Mickey-head pattern. My son’s only slight complaint was that the portion was a bit small, but they had no problem bringing him a second helping upon request. My choice for dessert was a bananas foster sundae, which featured vanilla ice cream with rum-glazed bananas and caramel sauce. It was really good and most certainly not on my diet! The children’s menu offered the Mickey Mouse shaped ice cream bars like you find in the theme park and they had no objection to adults ordering them as well. Both my wife and son went with those and we were pleased that the presentation was pretty nice. Instead of just serving them in the wrapper, they were placed on plates and some additional chocolate sauce was drizzled over the top of them. One problem that we encountered at dinner was that the drinking glasses had somewhat rounded bottoms while the tablecloth was fairly plush. My son’s water wasn’t served in a more kid-friendly cup (although they had them) and he ended up spilling all over the table at one point. This actually is really more than just a problem with not being kid-friendly as I actually spilled my iced tea at lunch a couple days later. They should probably either re-think the type of glasses they use or at least provide coasters of some sort. Another complaint we had was that Enchanted Garden is simply a bit too large for the theming to fully be experienced by all guests. 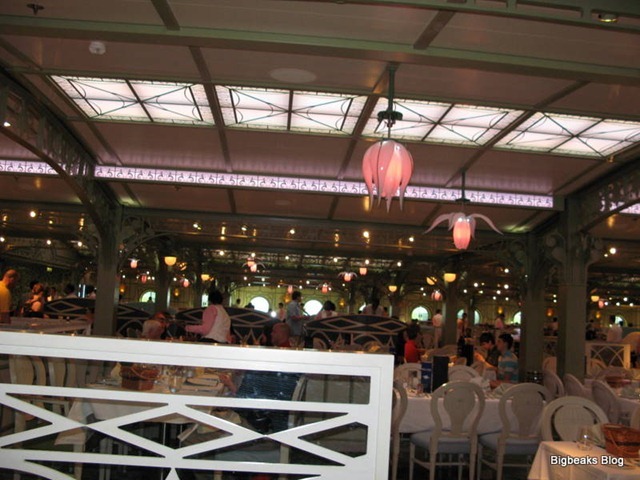 The show element of the restaurant is that the decor is supposed to change from daytime to night over the course of the meal. This is mainly done through projections and lighting in faux windows located in the center back of the restaurant. Our table was close to the front and on the far side, so I can’t say we really noticed that transition much. Our table was also right next to a port hole, which caused real outside lighting to overwhelm the themed lighting. To be clear, the meal, the restaurant and the overall experience were still very positive. These minor problems just made it a bit less impressive than what we had experienced on previous cruises, something that pretty much remained true throughout the rest of the dinners on this cruise.